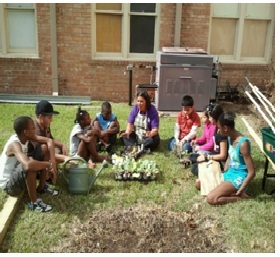 June 6, 2013-Most students learn about horticulture and how to start a business through text books and magazine articles. However by working with T.A.S.T.E (Teaching Agricultural Sustainability Through Economics) an entrepreneurial program ran by Community and Economic Development Cooperative Extension Agents Winnefred Jackson and Lloyd Hebert), the students at Odom Academy Middle School are getting hands on experience. The school, located at 2550 West Virginia Street in Beaumont, Texas is home to “Odom’s Organics” a farm and produce stand run by its middle school students. It’s a small farm whose biggest product is an education for Odom Academy’s agriculture students in how food gets to the table and entrepreneurial skills that can be used over a lifetime. On Thursday June 6, the school hosted its ribbon cutting ceremony for the grand opening of its produce stand. The student build produce stand included produce available for purchase such as okra, tomatoes, corn, watermelon, cucumbers, radish, squash, beans and fresh eggs. While many of the items were harvested at Odom Academy, some were purchased from a local farmers market. According to Odom Academy Agriculture Teacher Will Humber, purchasing from the local farmers market has taught his students about negotiating prices, and how to mark up produce to make a profit. The grand opening also included live entertainment by Odom Academy’s Jazz Band, a tour of the garden, various fruit trees planted by the local Girl Scout Troop, sausage links donated by AgriLand Farm Credit and salad using fresh vegetables from the garden and prepared by Odom’s Family and Consumer Sciences class. In support of the students the event was well attended by Prairie View A& M University Cooperative Extension Program Staff, Beaumont Independent School District Officials, local community organizations and local businesses. This entry was posted on Friday, February 7th, 2014 at 5:41 am and is filed under Uncategorized. You can follow any responses to this entry through the RSS 2.0 feed. You can leave a response, or trackback from your own site.